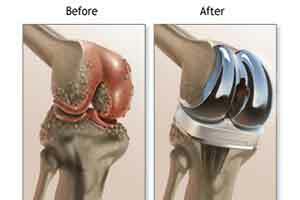 Pune : A 54-year-old woman, unable to walk or sit for almost a decade due to osteoarthritis, has been cured after undergoing Golden Knee Replacement surgery at a city hospital, authorities said. Sanjivanee Watane’s problem was in her right knee, a result of ignoring pain in the initial stage. Soon the pain became unbearable and visits to doctors and physio-therapists did not yield any positive result. After extreme osteoarthritis was diagnosed, she was told that a total knee replacement was the only solution. Arthritis & Osteoarthritis (OA) is the most common chronic condition of joint pain affecting knees, hips, lower back and neck and even small joints of the fingers. It affects 80 per cent of the people above 50 years of age. Watane got admitted to Global Hospital and Research Centre, Pune, where she underwent the gold knee-blended transplant with vitamin e Plus poly cover, a type of total knee transplant. Three days after the surgery, Watane started walking. She initially experienced pain but it dwindled within days. According to the doctors, Vitamin e Plus poly cover with Gold-plated knee joint is an innovative, next-generation implant with high-density polymer blended with vitamin E, a natural anti-oxidant. Aashish Arbat, senior orthopaedic surgeon, who performed the surgery, said Gold Knee implant can be the solution for people requiring knee replacements at a young age or for the obese. “This helps the material hold up to the higher expectations of today’s active patient. E-plus is the first blended vitamin E polyethylene, with the vitamin E homogeneously blended directly into the resin,” Arbat added.